Corsair Buck Yeah, oh yeah! Corsair Distillery is a complete accident. Darek Bell and Andrew Webber were childhood friends. Darek and Andrew would hang out in Darek's garage and make home-brew beer. They set out to invent a new biodiesel process and got stuck. Andrew said that making biodiesel was hard, but making Whiskey would be a lot easier. So Darek went off to the Bruichladdich Distilling Academy and next thing you know… Today Corsair has seven core products and nineteen “seasonal and experimental” releases, all emblazoned with a logo that looks like it came from a “Reservoir Dogs” movie poster. 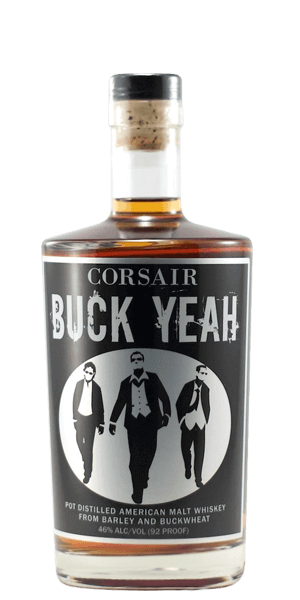 Corsair Buck Yeah is a Whiskey made from buckwheat and Victory Malt. To call this combination “unique” would be an understatement. First, buckwheat is not wheat… it is a plant related to the rhubarb that is cultivated for its grain-like seeds. Victory Malt is a brand of a barley malt usually used to bring a toasted, nutty flavour to ale. Buck Yeah is one of their “seasonal and experimental” products and is one of the most interesting things we’ve tasted this year. With its spiciness, try it wherever you would use Rye. What does Corsair Buck Yeah taste like? The Flavor Spiral™ shows the most common flavors that you'll taste in Corsair Buck Yeah and gives you a chance to have a taste of it before actually tasting it. An excellent whiskey. Smooth. Nice nuttiness and a bit of sweet. Very nice whiskey, different than your typical bourbon. Chocolate and vanilla tones in the palete, and does have an nice oily texture. Finishes dry and smooth. Enjoyed with a large bourbon ice cube.